For the RSS, the stakes are high with a BJP-majority government at the Centre for the first time. Indian Express traces the history of RSS’s relations with governments down the years. Prime Minister Narendra Modi and Rashtriya Swayamsewak Sangh (RSS) chief Mohan Bhagwat attended a co-ordination committee meeting of 93 top RSS-BJP leaders in Delhi last week. It was Modi’s first such meeting since forming the BJP-led NDA government in May, 2014. For the RSS, the stakes are high with a BJP-majority government at the Centre for the first time. SHYAMLAL YADAV traces the history of RSS’s relations with governments down the years. The RSS has always insisted that it is a cultural organisation and not a political body. But that was not the view held by various governments at the Centre over the years. In fact, as early as in 1966, the Home Ministry had issued an official order which barred government employees from participating in activities organised by the RSS or Jamaat-e-Islami. That order remains in force at the Centre, even though there have been flip-flops in states such as Madhya Pradesh, Himachal Pradesh and Chhattisgarh, depending on which government was in power there. Since 1947, the RSS has been banned thrice by the Central government. The Sangh faced its first ban from February 1948 to July 1949, following the assassination of Mahatma Gandhi by Hindu fundamentalist Nathuram Godse. It was banned for the second time during the Emergency (1975–77) and again, for six months, after the demolition of the Babri Masjid on December 6, 1992. The RSS found itself politically isolated in the years following the assassination of Mahatma Gandhi. In the absence of a mainstream political face, the RSS leadership found it very difficult to engage with the government. Although some leaders were in favour of the organisation playing a direct political role, the then sarsanghchalak or chief M S Golwalkar was against the idea. It was against this background that some in the RSS floated the idea of forming a political party. This led to the formation of the Bharatiya Jan Sangh (BJS) in 1951. The BJS contested the 1952 elections and included leaders such as Deendayal Upadhyaya, A B Vajpayee, Nanaji Deshmukh, L K Advani and others who moved from the RSS to the new cadre-based political party. In the early 1950s, just after the first Lok Sabha elections, differences developed between Golwalkar and another senior leader Balasaheb Deoras on many issues, one of which was the latter’s insistence that the RSS should enter politics. The rift led to Deoras pulling out of the daily functioning of the Sangh. Deoras returned after a few years and became the RSS chief in 1973, after the death of Golwalkar. The agitation against the Emergency brought RSS leaders closer to other Opposition leaders and parties. The BJS was part of the Janata Party-led government that was formed in 1977 in a coalition that also included Congress (O), Bharatiya Lok Dal and defectors from the Congress (R). But soon, some Janata Party leaders, such as Raj Narain and Madhu Limaye, raised the issue of dual membership held by the BJS ministers and said they should refrain from participating in RSS activities. But the Janata government collapsed and in April 1980, the BJS was reborn in a new avatar called the Bharatiya Janata Party (BJP). It was not a smooth beginning though with some RSS leaders opposing the Vajpayee-led BJP’s slogan “Gandhiwadi samajwad” (Gandhian socialism). The first NDA regime was not a BJP-majority government but RSS leaders still held regular meetings at Prime Minister Vajpayee’s residence with senior Union ministers and BJP leaders. The most visible sign of this linkage was an attempt by HRD Minister Murli Manohar Joshi to apply RSS policies in the education sector. However, the political compulsions of managing a coalition meant that many RSS-linked leaders such as Dattopant Thengadi of the Bharatiya Mazdoor Sangh (BMS) and Ashok Singhal of the Vishwa Hindu Parishad (VHP) became frustrated with the Vajpayee government. Besides, the RSS, led by K S Sudarshan, found it difficult to match the political heft and stature of BJP leaders such as Vajpayee and Advani. Not surprisingly, after the NDA lost in 2004, the RSS started questioning the leadership of Vajpayee and Advani, with Sudarshan saying that the BJP’s senior leaders needed to make way for the juniors. The popularity of Narendra Modi and the hard work of RSS are widely believed to have been the main factors that powered BJP to its first majority government at the Centre in 2014. And this time, a more organised mechanism has been put in place to manage the RSS’s ties with government. 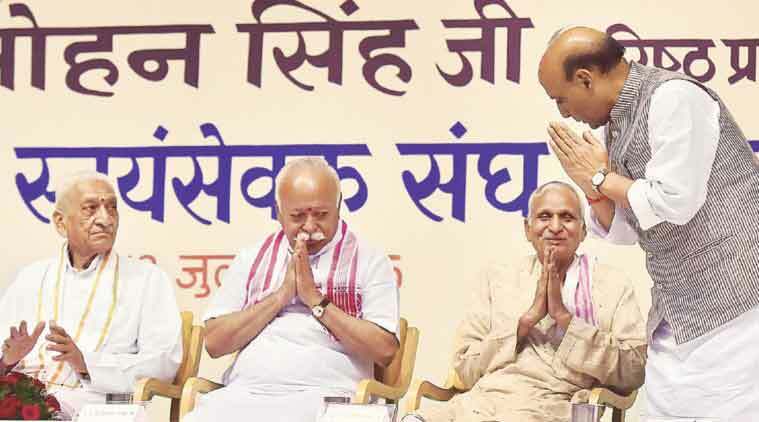 There is a top level co-ordination committee of RSS and BJP leaders, including Suresh Bhaiyyaji Joshi, Suresh Soni, Dattatreya Hosbale and Krishna Gopal from the Sangh, and Home Minister Rajnath Singh, Transport Minister Nitin Gadkari, External Affairs Minister Sushma Swaraj and BJP president Amit Shah representing the party. The panel also includes leaders bridging both sides — BJP general secretaries Ramlal and Ram Madhav. At the same time, different groups of experts, pracharaks and other senior functionaries from the RSS have been regularly meeting ministers dealing with key sectors, such as education, culture, finance, commerce and labour. These meetings are co-ordinated by Krishna Gopal, the RSS’s BJP in-charge. Besides, several crucial appointments have allegedly been based on recommendations from the RSS, and it is believed that many Union ministers wait for the Sangh’s approval before taking decisions on key issues. Also, several bureaucrats and other government officials have been seen meeting RSS leaders allegedly for preferred postings. On its part, the RSS appears to have put on hold some of the prominent items on its agenda such as the construction of the Ram temple at Ayodhya, the removal of Article 370 in Jammu and Kashmir and enforcement of the Uniform Civil Code. In 1990-91, the BJP came to power in MP, UP, Rajasthan and Himachal Pradesh after a long gap. Soon, RSS leaders started holding regular meetings with ministers in those governments allegedly in a bid to manage their functioning. But the BJP managed to retain only Rajasthan from those four states in the next round of Assembly elections.